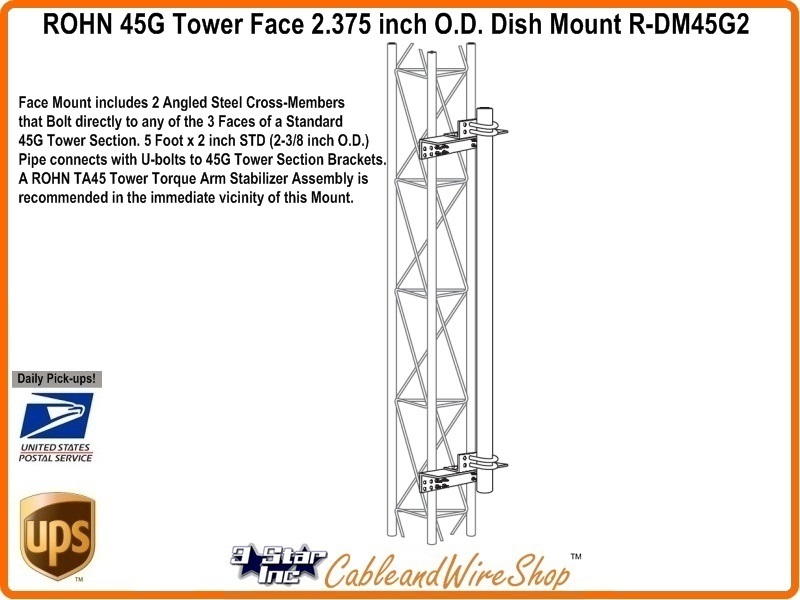 Face Mount includes 2 Angled Steel Cross-Members that Bolt directly to any of the 3 Faces of a Standard 45G 45GSR Tower Section. 5 Foot x 2 inch STD (2-3/8 inch OD) Pipe connects with U-bolts and Brackets to Tower Section. A ROHN TA45 Tower Torque Arm Stabilizer Assembly is recommended in the immediate vicinity of this Mount. Note: ROHN DM45G2 mount goes together quickly, with a minimum of bolted connections. The angle steel cross members connect directly to the tower legs with easy-to-use u-bolts. This mount is hot dip galvanized. American Steel. Buy ROHN, Buy American.